There have been a few adjustments to public transportation around UB since we first posted about how to ride the bus here. 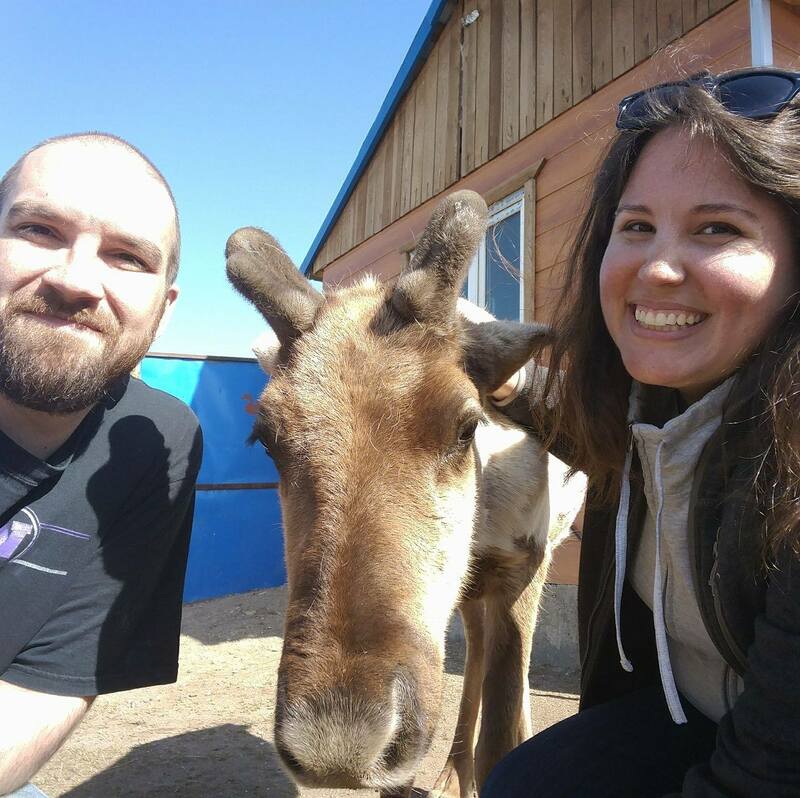 When we returned to Mongolia from the US at the end of the summer, we returned to a completely overhauled bus system–new payment method, new bus lines, and new bus numbers/routes. Just to be safe, we avoided riding the buses for the first few weeks until we could figure everything out a bit. Even so, we’ve had a few mishaps–of course!–but nothing too grievous. The biggest update is the method of payment. Instead of a fare collector moving up and down the bus and getting you to pay up, the system is much more automated. Now, you buy a bus card and put money on it. Once you get on the bus, you let the electronic reader scan your smart card and the reader automatically deducts money from it. It reminds me a lot of the ORCA cards in the Seattle metro area, actually. The cards have all different kinds of designs, but this is what mine looks like! When we first bought our cards, we had a hard time tracking down a kiosk where we could purchase them and add money, but now they are much easier to find. Most of the major bus stops have kiosks nearby where you can either purchase a card or refill your card. Just look for the UMoney logo (image below). In a pinch, you can still pay in cash as you get on the bus (there’s a collection box next to the card readers), but I’m not sure if that will be a permanent alternative or not. Fares themselves don’t seem to have changed. It’s still 500 tugrug to ride the buses. I can’t speak for the trolleys since I haven’t used once since we’ve been back. I suspect that’s the same. 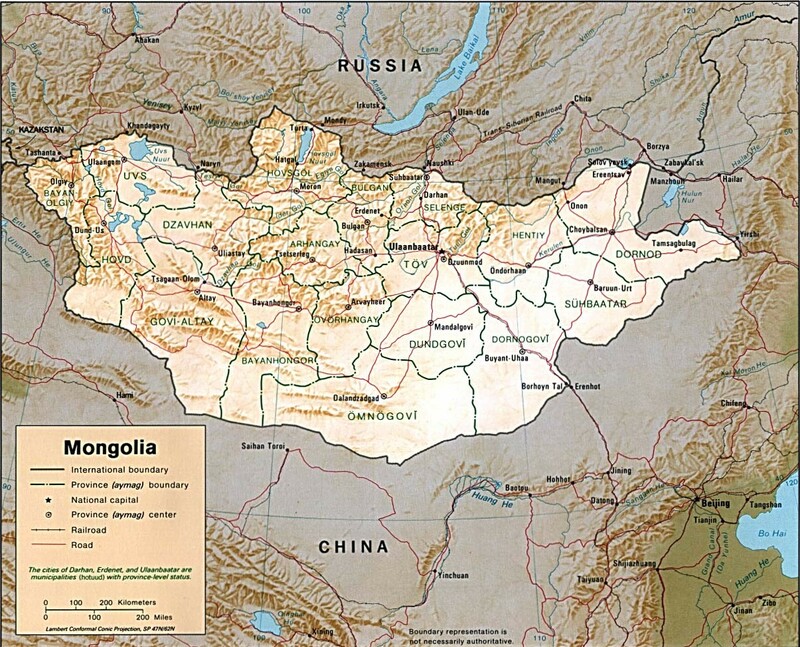 Another cultural tidbit…most Mongolians are pretty quiet on public transportation, at least compared to Westerners. Most people, if they talk at all, have quiet conversations with their traveling companions. If you don’t want to stand out more than you already do as a foreigner, keep your conversation volume down. Usually I’m so focused on trying not to fall over and keeping an eye on my bag that I don’t have the brain capacity to chat anyway, and anyway, having a conversation means you’re paying less attention to your surroundings, which makes you both more likely to miss your stop and to be a better target for pickpockets. Every locale has a form of public transportation. NYC has the subway. Paris has the metro. Nairobi has matatus. San Francisco has the BART. Every transportation system has its quirks, and you can usually spot the local from the foreigner wherever you are. Learning how to use local public transportation is invaluable, yes? In UB, there are three kinds of public transportation: the buses, taxis, and “micros.” For the sake of this post, I’ll focus on the buses. We’ve had more than our fair share of interesting stories that range from miscommunication with the fare-collector to winding up on the opposite side of the city to being pickpocketed. However, since we do not have a personal vehicle, we usually bus around town. 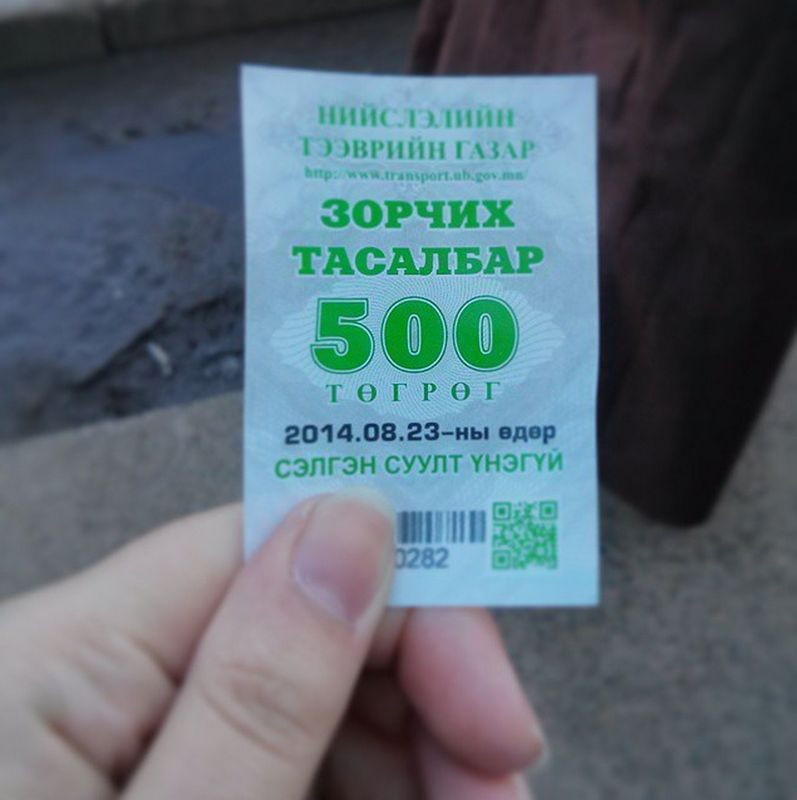 This is from summer 2014 when the government temporarily implemented a single ticket for a whole day. Usually, you must pay per bus/trolley. You will pay your fare to a person, not a box. Fare-collectors know exactly who gets on the bus at each stop–even when they are incredibly full–so s/he will find you. Basic courtesy rules apply here. If a senior citizen, mother with small children, person with a disability, or a pregnant woman get on the bus, you should offer him or her your seat. More than likely, a Mongolian will beat you to it, but be willing to offer up your seat if you are young and/or able-bodied. Be aware that personal space is different in the East than in the West. 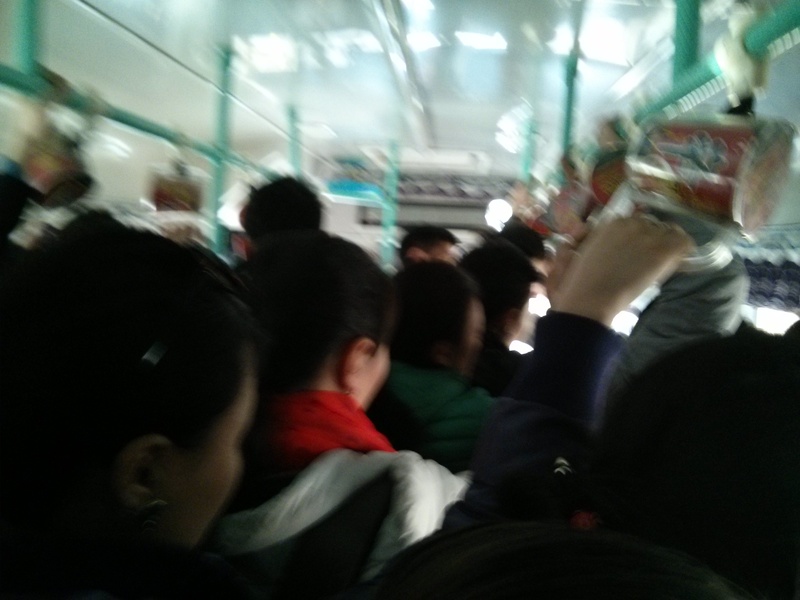 For example: this bus could easily be more crowded than it is already. A note about very crowded buses and trolleys: you are more easily robbed on crowded public transportation than on nearly empty public transportation, as is the case in any major city. In the jostling, it’s easy to overlook prying hands. Both Eric and I have been robbed on public transportation, even though we know better. It just takes one moment of not paying attention to lose your stuff. Always keep your bag in front of you and keep your hand over zipper(s) if possible. Don’t ever put your wallet or phone in a back pocket. Even front pockets are vulnerable, but they are less vulnerable than back pockets. If possible, avoid bringing large amounts of cash or credit cards on the bus unless you absolutely have no other choice. Vehicular transportation in Mongolia is a bit of a wild ride. Traffic is pretty terrible–the government is constantly envisioning new ways of improving city traffic–but miraculously, it works. I have to give mad props to bus drivers for navigating this traffic, but it often results in abrupt starts and stops. So, if you aren’t lucky enough to get a seat, here are my suggestions for maintaining your balance on the bus. Stand facing the side of the bus, not forward. This will give you a little more stability. If you are taller (like us), hold on to the rail instead of the hanging hand-holds. I’m just tall enough that using a hand-hold will make me lurch forward and backward enough that I risk completely running over the shorter people around me. Stand with your feet a little farther apart than shoulder-width (unless the bus is REALLY crowded). Stagger your feet a bit. Tighten your core muscles and keep your legs loose. Basically, keeping your balance means you’ll more or less “surf” the bus, bending your knees and swaying with the movement. If you lock your knees and keep your legs stiff, you will lose your balance. A very empty bus! This is uncommon. With some other ELI teachers. Eric’s so tall that sometimes, he hits his head on the roof of the buses. The frost is on the INSIDE of the window. Most of the windows on the bus have a smaller section like this that’s been taped off. Somehow, it doesn’t fog up or ice over, helping you see your stop.